February 3, 2013 Daniel G.
According to the Cost vs. Value Report, REALTORS judged a steel entry door replacement as the project expected to return the most money, with an estimated 85.6 percent of costs recouped upon resale. The steel entry door replacement is the least expensive project in the report, costing little more than $1,100 on average. A majority of the top 10 most cost-effective projects nationally in terms of value recouped are exterior replacement projects; all of these are estimated to recoup more than 71 percent of costs. The 2013 Remodeling Cost vs. Value Report compares construction costs with resale values for 35 midrange and upscale remodeling projects comprising additions, remodels and replacements in 81 markets across the country. Data is grouped in nine U.S. regions, following the divisions established by the U.S. Census Bureau. This is the 15th consecutive year that the report, which is produced by Remodeling magazine publisher Hanley Wood, LLC, was completed in cooperation with NAR and REALTOR Magazine. 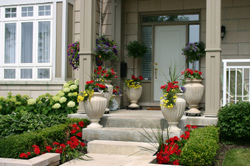 REALTORS provided their insights into local markets and buyer home preferences within those markets. The 2013 national average cost-to-value ratio rose to 60.6 percent, ending a six-year decline. The ratio represents nearly a three-point improvement over 2011-2012. Lower construction costs are the principal factor in the upturn, especially when measured against stabilizing house values. In addition, the cost-to-value ratio improved nationally for every project in this year’s report and is higher than it was two years ago for both remodeling and replacement projects. Results of the report are summarized on NAR’s consumer Web site HouseLogic.com, which provides information on dozens of remodeling projects, from kitchens and baths to siding replacements, including the recouped value of the project based on a national average.